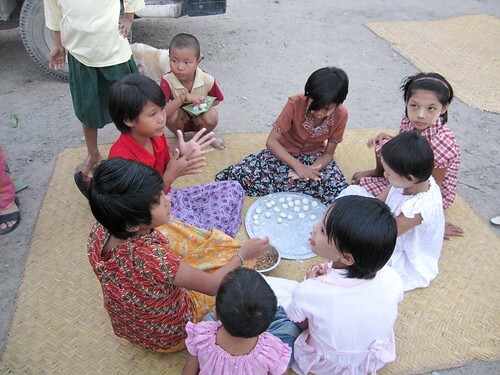 Burmese New Year begins this weekend - a week long Buddhist festival which is known as Thingyan in Burma aka Myanmar. 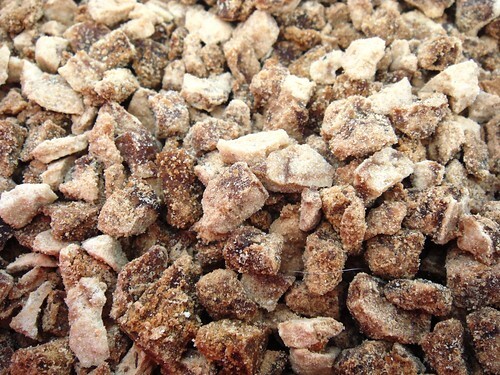 Three of the signs that signify that Thingyan has begun are that people start chucking water at each other indiscriminately in the spirit of mischievous fun, the sunshine yellow padauk flowers are blossoming, and the sweet snack known as Mont Lone Yay Paw (or mote lone yay paw) is dished up to everyone. 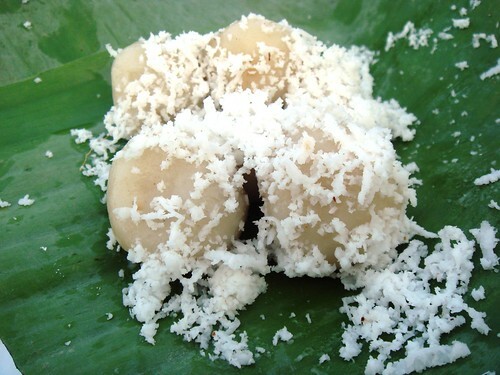 A traditional Burmese dessert, similar to Malaysia's onde onde, China's tangyuan and Indonesia's klepon (and, I suspect, influenced by all these), mont lone yay paw is to Thingyan what plum pudding is to Christmas Day - ie if you're having a pud to celebrate the occasion, you wouldn't dream of serving up anything else. 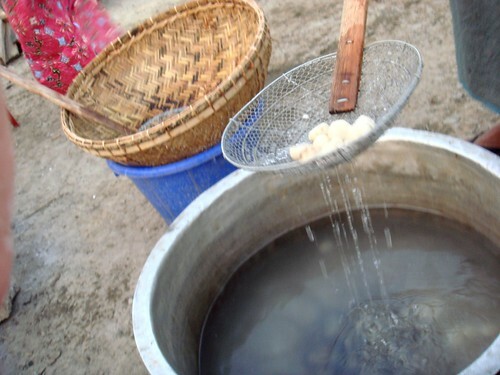 The name mont lone yay paw literally means "round snack on the water" in Burmese, as it's made by boiling up balls of rice dough which bob along on top of the bubbling water when they're ready to eat. 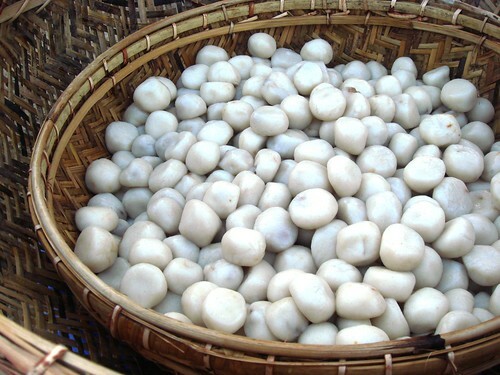 The balls are stuffed with palm jaggery which we call htanyet, although you can substitute palm sugar. 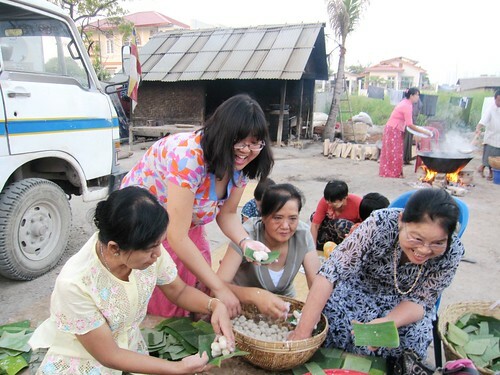 In keeping with the playful spirit of Thingyan, some folk will stuff the occasional ball with bird's eye chillies instead and offer them to unsuspecting friends. 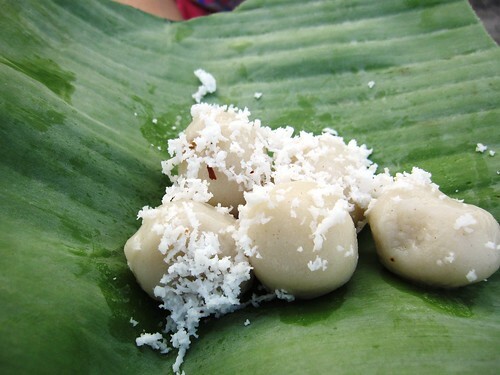 Mont lone yay paw are usually served on a square of banana leaf, and occasionally scattered with grated coconut if such a luxury is available. One of the nicest things about mont lone yay paw is that you often make it in a big group, chatting away as you roll the balls in unison and throw them into the water. 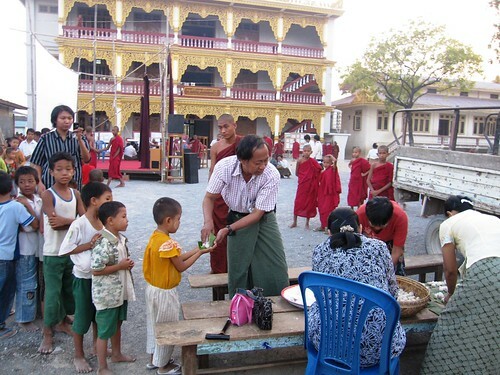 A few years ago, one of my uncles invited my family to join a big group of people to make mont lone yay paw for the students and monks at a monastery-run school just outside Mandalay. Even the children joined in rolling the balls, and their happy faces as they queued to receive the finished sweets which they'd helped to make themselves was a genuine joy to behold. Sift the flours and salt into a large bowl and mix thoroughly. Add the water and knead until it forms a pliable dough. If you want half the balls to be green, divide the dough into two, add the food colouring to one half, and knead again till the colour spreads evenly. 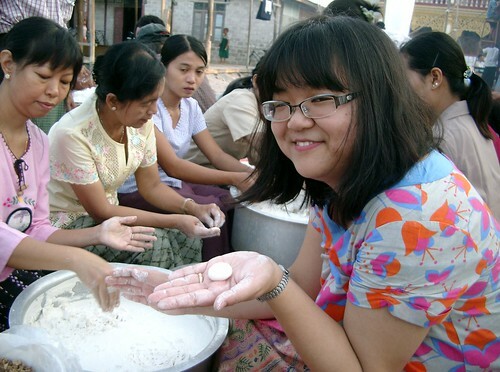 Take a small piece of dough, roll it into a ball with about a 3cm diameter (see the photo of me holding one above) and then flatten it into a circle. 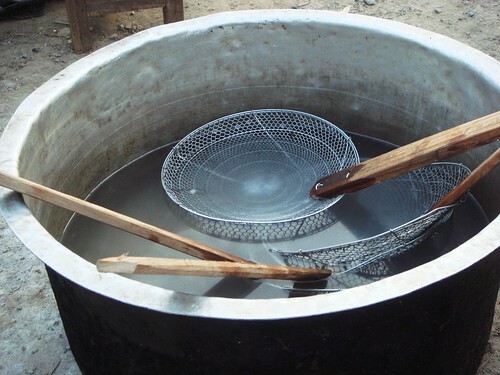 Place a chunk of palm sugar in the middle of the circle and then roll the dough back into a ball so you cover the chunk of sugar up completely. Repeat for the rest of the dough till you have about 20-30 balls. If you're feeling naughty, stick a chilli into the odd ball. 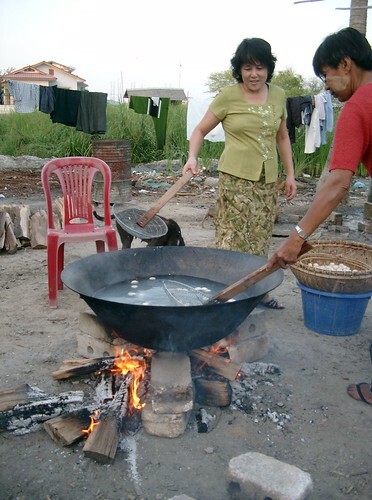 Fill a stockpot or large saucepan with water and bring to the boil. Once it's ready, drop the balls in one by one. They will sink to the bottom at first, but then float to the surface of the water when they're ready (hence the name). 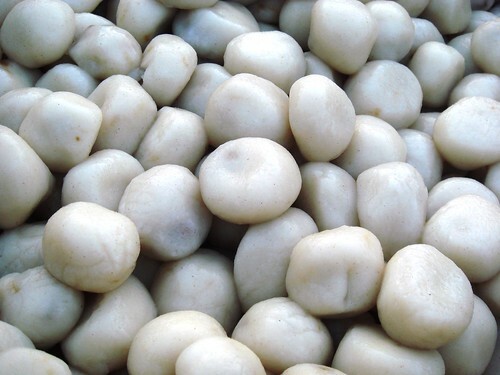 Remove the balls with a slotted spoon, and dish up on squares of banana leaf or saucers - you want 4-5 balls in each serving. Scatter the balls with the shredded coconut and serve whilst still warm.